Vype has unveiled its exclusive limited-edition collaboration with British fashion brand, House of Holland (HoH) on the runway at London Fashion Week. In celebration of the new Vype ePen 3, the capsule collection taps into the UK’s passion for fashionable tech, fusing the sleek design and sophisticated technology of the all-new ePen 3 with Henry Holland’s signature style of bold, disruptive design with a playful colour palette to match. The SS19 House of Holland show featuring the Vype capsule collection saw a whole host of celebrities in attendance, including A-list presenters Nick Grimshaw and Laura Whitmore, and musician Nadia Rose. The after party held at Hotel Café Royal was also attended by Nicola Roberts, Jamal Edwards and Olivia Cox, where guests could get hands on the limited edition Vype x House of Holland collection for the first time. The Vype x House of Holland capsule collection boasts five style-led ePen 3 limited edition designs plus three on-trend vaping fashion accessories. The ePen 3 designs are available in five colourways to suit all styles; neon pink, neon yellow, black & white, purple & orange and mint choc. The colour-popping designs are the result of Henry’s work with New York artist, Andrew Brischler, and reflect the increasing speed and anxiety consumers experience in everyday life. Each limited-edition design not only looks the part but is stylishly compact for on-the-go use. 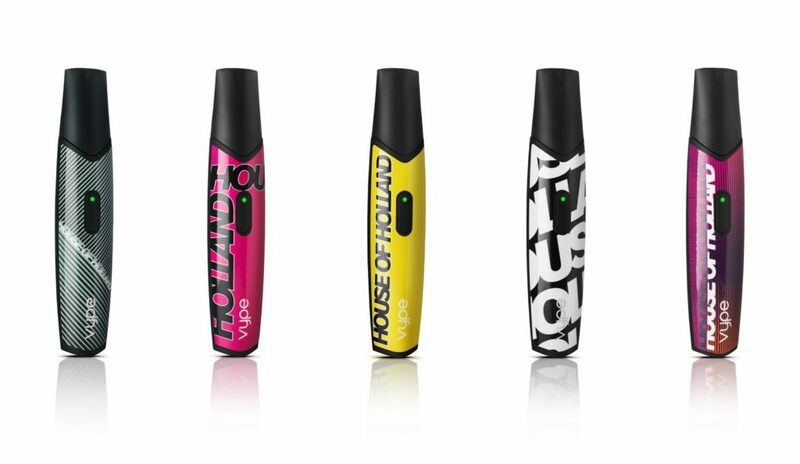 Completing the collection, House of Holland has designed three bespoke vaping accessories; a neck wallet, body harness and a clutch bag, of which have been lovingly designed to hold and show off the ePen 3 in all its glory. At the cutting edge of closed-system vaping technology, the Vype ePen 3 provides a genuine alternative to adult smokers & vapers looking for a smoother and more satisfying experience. The device’s powerful 650mAh/6W battery supplies an intense flavour and is designed to deliver plenty of puffs through the day, taking only two hours to fully charge. Meticulously designed and rigorously tested, the Vype ePen 3 Pods feature a simple ‘click fit’ design, making it smoother and simpler to swap between one of the seven intense flavours including; Blended Tobacco, Crisp Mint, Wild Berries, Golden Tobacco, Dark Cherry, Fresh Apple, and Infused Vanilla. Like perfumery and champagne, Vype eLiquids blend art and science to create flavours to savour. All Pods have a no-spill design for an enjoyable, and no-mess, vaping experience. This incredibly simple to use, high-performance system guarantees satisfaction with a reliable all-day use battery*, making it the ultimate choice for smokers and vapers. Designed with the user in mind, the smooth and compact device fits comfortably in hand and discreetly into pockets. With click in-and-out pods** Vype ePen 3 is designed to be a convenient and simple to use device, while a wide range of flavours and nicotine strengths provide a choice for each vaper. The Vype x House of Holland capsule collection will be available to buy for a limited period only at: www.govype.com.